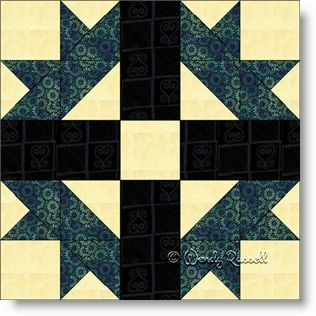 Mexican Star is one of the many favourite 10" quilt block patterns that can be constructed in a couple of ways. I have chosen to use half square triangles and quarter square triangles to use familiar quilt patches and also as a teaching experience. I have also included instructions for a larger block as well. You can make many variations in your personal quilt by adding sashing, as shown in the illustrations, or perhaps see what secondary patterns you can create by placing blocks side by side. Imagination is the only requirement.